1 of 1 Cook 8 oz freekeh (such as Freekeh Foods) according to package directions; drain. In a bowl, whisk together 3 tbsp each olive oil and white wine vinegar, 1 tsp Dijon mustard, 1/2 tsp salt and 1/8 tsp pepper. 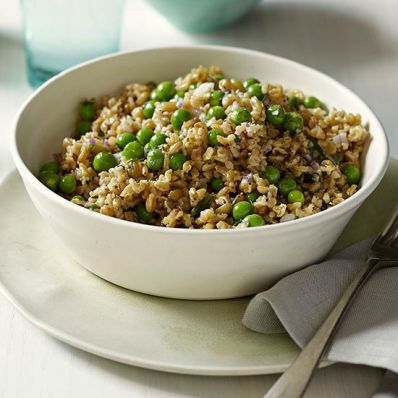 Stir into freekeh and set aside to cool. Bring a pot of lightly salted water to a boil. Add 8 oz shelled fresh or frozen peas. Blanch 1 to 2 minutes; drain and run under cold water to cool. Mix into freekeh with 2 tbsp each finely diced shallots and chopped fresh tarragon. Serve at room temperature or chilled.